How to choose a hosting service for your website? Choosing the right hosting service should be a priority for the owner of a website. Any possible problems can lead to tangible financial losses in the form of unrealised revenues and additional expenses. Your image may also suffer and that would be hard to convert into money. The market offers a lot of options. You should know which of them are the best in what circumstances. Every website has its own characteristics. That’s why you need a hosting service tailored to its specific requirements. Relying on general offers doesn’t provide the ability to select the right solution. Besides analysing publicly available materials related to each service provider, it’s worth sending them detailed inquiries. If the company offering data centre services has a proper understanding of customer’s needs, it is a good sign that makes us believe we’ll be able to establish effective cooperation based on partnership. In the context of the best offer for a given website, it is important to focus on four key elements: technology, performance, functionality and security. Technological aspects are the starting point in preparing queries and finding the right vendor. You should be aware of what technology was used to create the website (back-end) and on what platform it will work. Most often it is a choice between Linux-based servers (websites developed using PHP, Python, Ruby) and those operating under Windows (e.g. .Net, ASP). There are also technologies that operate efficiently in both of these environments (e.g. Java). In addition to the programming language, the kind of used database is also important (MS SQL, MySQL, PostgreSQL, Oracle, DB2). We have to make sure that the hosting company provides a service compatible with the technology of our website. Performance of the website is a parameter, the definition of which at the beginning of the functioning of a website or application is based largely on assumptions. You have to answer the question of what sort of traffic – i.e. the number of users at a given time – we expect and what resources will be needed for the functioning of the website (e.g. a very large storage space or computing power, databases capable of handling lots of records). It’s good to see if it would be possible to rapidly scale the efficiency of the service – permanently or temporarily – when the assumptions are exceeded for some reason. Issues related to the functionality are especially important for websites that need or could potentially require an unusual server configuration or have customized needs in terms of server software (e.g. video streaming). Security issues are one of the elements we need to pay attention to when selecting a hosting service provider. Securing the website consists in, e.g. physical separation of the front-end and the back-end, granting access only via VPN and other safeguards related to the widely understood information and communication technologies. Issues of physical security related to ensuring uninterrupted power supply, lack of access to the hosting space by unauthorized people, extinguishing systems, anti-flooding protection, networks and devices redundancy, etc. are equally important. Besides examining the conditions in relation to the website and potential hosting providers, it is important to familiarize ourselves with the basic options available in the market, i.e. the types of web hosting services. From among them we select not objectively the best one, but the one that is best suited to our needs and functionalities. 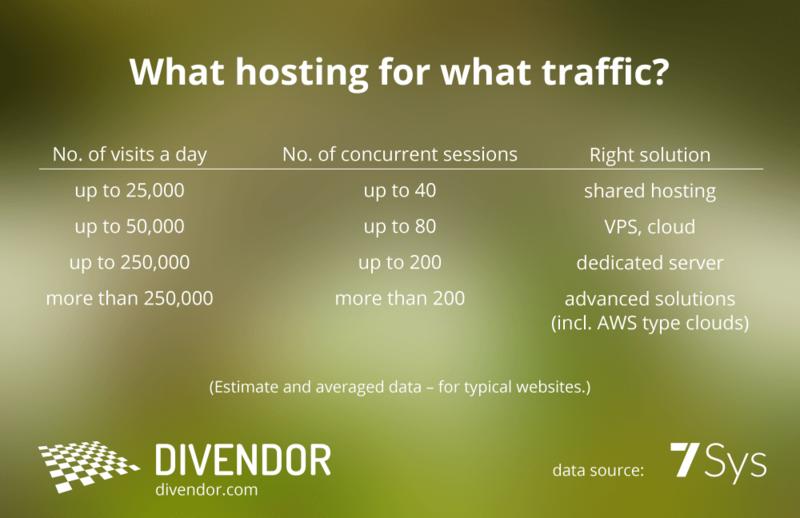 Shared hosting is the cheapest option but it’s sufficient in the vast majority of cases. Its cost usually doesn’t exceed a few dozen dollars a year. The service provider offering such hosting hosts hundreds of their clients’ websites on a single server. The service includes basic functionalities, databases, specific disk space and transfer per month. It is supplied with an administration panel that allows for easy configuration of the service. It is able to handle up to 15-40 concurrent website users. Shared hosting works well for blogs and typical corporate websites that don’t register much traffic (up to 25,000 visits a day). The advantage is the low price and ease of use. The disadvantage is the low performance and the risks resulting from sharing disk space with many other clients which may result in deterioration in the functioning of the website due to “clogging” the server with traffic to another site. VPS (Virtual Private Server) – is part of a separate physical server with guaranteed resources in the form of CPU threads, memory and disk space. From a functional point of view, this solution is almost equivalent to a dedicated server. The customer receives “root” type access which allows for independent – or with the help of a hired administrator – server management (installation and configuration of the operating system and software). Sometimes VPS come with an administration panel, allowing for limited server management. Unfortunately, the default settings are rarely optimal. VPS is a solution for websites whose owners depend on their high availability. It provides independence from other websites and applications residing on the physical server and allows for the storage of slightly more resources than on a shared server, as well as for the use of non-standard functions or server configuration. VPS work well for websites that record about 5,000 visits a day. The advantages of this solution are reasonable prices (from several dollars per month) and the fact that resources of each client are independent of each other. The disadvantage of VPS is the need to use the help of an administrator and the average performance. A dedicated server is a solution for large websites. A physical machine placed at a data centre is entirely at the disposal of one customer. Often, the service is provided in a “managed” version, where the service provider manages the server for a certain number of hours per month as part of the package. If there is a need to divide a solution into individual applications, separate VPS can be configured on a physical server. A dedicated server will be a great solution for websites that require higher performance (e.g. with respect to heavy traffic) as well as better functionality and security. The number of daily visits that can be successfully handled can reach up to 250,000 in the case of this solution. A dedicated server gives you complete freedom in terms of management and provides high performance, however, it requires support of an administrator and is an expensive solution. The monthly fee can range from a few dozen to a few thousand dollars and is dependent on the server parameters and scope of the service provided. Cloud solutions have become very popular recently. They are functionally similar to a VPS service, supplemented with features resulting from the dynamic and distributed infrastructure. The main benefits of using the cloud are large scalability (increasing resources within a maximum of several dozen minutes without the need to migrate to another server) and high availability – in the event of failure of one device, the website is provided using a different one operating within the cloud. This solution is good for startups expecting rapid growth of traffic. Besides scalability and high availability, the advantages of this solution also include the separation of resources. From the point of view of a small website, the price starting at several dozen dollars per month can be considered a disadvantage of a cloud solution. Additionally, in order to use the cloud you require the services of an administrator. Big websites (e.g. portals) and popular web apps use more complex solutions. This is due to the fact that they require more resources than can be provided by one – even the most powerful – dedicated server. In such situations, multi-server solutions are built – so-called clusters. What hosting for what traffic? When deciding on a hosting service, the owner of the website or web app should consider a few more options. Not every company providing hosting services has in its offer all the solutions important from the point of view of the customer. It may be that this element will allow you to choose the best provider. Here are four additional services which, objectively, seem to be the most important. In the event of a crisis, a backup copy may prove to be a salvation for your website. Making regular backups is a key issue. Contrary to what you might think, this service is not offered by default in all hosting plans. You have to make sure that backups are performed regularly (preferably once a day) and that you have access to several historical copies to be able to restore a version of the website from, for example, last week. What is to be copied is also an important matter. Above all, website’s files and its database must be saved. In the case of solutions administered personally, it’s also wroth copying the system configuration and server’s applications. The costs related to creating a backup should be treated as an investment in a kind of insurance policy, taking into account the worst-case scenarios. Firewall is now a necessary element in the security context of the website. Network security represents an additional layer of defence against hackers. It’s worth paying particular attention to these solutions that include protection against recently popular DDoS attacks that rely on blocking the website by saturating the server resources with thousands of “visits” generated by a network of “zombie” computers, i.e. taken over by hackers. Content Delivery Network is a service supplementary to hosting. It is based on the fact that the static content of the website (mainly graphics, but also CSS, JS and downloads) is made available through a global network of servers located in many parts of the world. Foreign user, instead of downloading static content from a server located on the other side of the world, downloads it from the nearest CDN node. This very clearly accelerates the operating of the website for users from other countries. Such a solution is most useful for websites that are global in nature. Monitoring the availability of a website or an app as a service provided by an independent vendor is a very valuable supplement to hosting. Of course, hosting providers always monitor websites and even often provide clients with some reports. However, running an additional external monitoring is always worth it. It will verify the actual quality of the hosting service by checking the availability of the website or the app that is being hosted. Furthermore, modern services don’t really monitor the servers but the websites themselves – therefore they monitor not only their availability but also the basic functionalities. This allows you to intervene if problems arise. For large websites with high requirements, it’s best to contact a specialist who will design a solution tailored to your needs. Such a person can also help you choose the right provider. 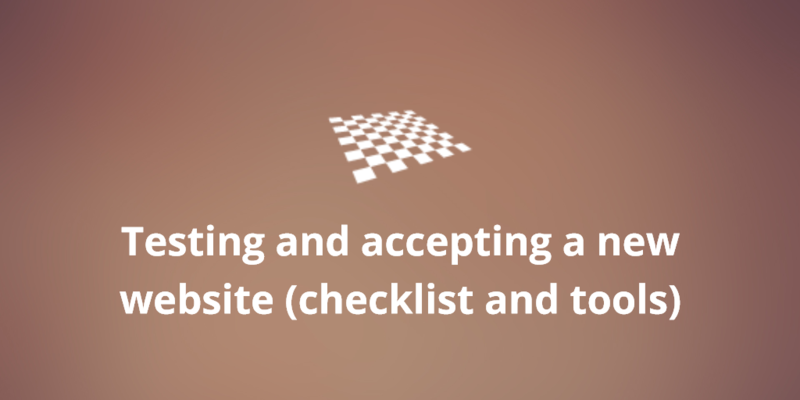 ← How to optimally configure the monitoring of a website?